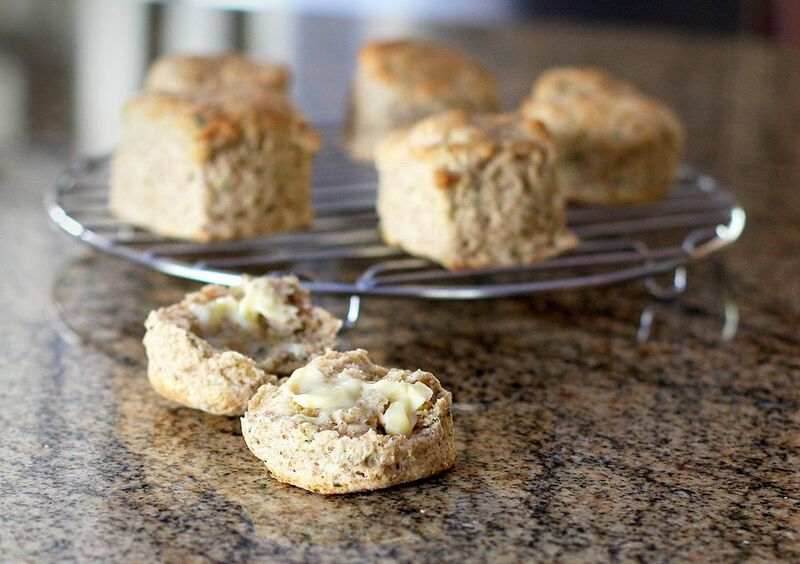 These light and delicious savory whole wheat biscuits are made with about half whole wheat flour. Green onions and a little parsley makes these tasty wheat biscuits extra special. These biscuits are super easy to make; most of the mixing is done in the food processor. These are wonderful biscuits to enjoy with a hearty stew, or top with ham or turkey slices. Heat oven to 425° F. Line a baking sheet with parchment paper or silicone mat. In food processor, combine the flours, baking powder, soda, salt, and sugar, if using. Note: If you don't use a food processor, work the butter into the dry ingredients with a pastry blender until the mixture resembles meal, then add finely chopped green onion and parsley. Stir in the buttermilk until ingredients are just moistened. Turn out onto a floured surface and knead 2 or 3 times, just until you have a soft cohesive dough. Pat out into a circle about 3/4-inch thick. Cut out with biscuit cutters and arrange on the baking sheet. Bake for about 11 to 14 minutes, until lightly browned.